Chile is ranked as a high-income economy by the World Bank and is considered to be South America’s most stable and prosperous nation. It leads Latin American nations in competitiveness, income per capita, economic freedom and low levels of perceived corruption. Although Chile has high economic inequality as measured by the Gini index, it is close to the regional mean. Chile has a market-oriented economy characterised by a high level of foreign trade and a reputation for strong financial institutions. It also enjoys a sound economic policy, which has given it the strongest sovereign bond rating in South America. Exports of goods and services account for approximately one third of GDP, with commodities making up some 60 percent of total exports. Copper is Chile’s top export and provides 20 percent of government revenue. Chile deepened its long-standing commitment to trade liberalisation when it signed a free trade agreement with the US, which came into force on January 1, 2004. Chile now has 22 trade agreements covering 60 countries, including agreements with the EU, Mercosur, China, India, South Korea and Mexico. In May 2010, Chile became the first South American country to join the Organisation for Economic Cooperation and Development (OECD). According to the OECD, economic inequality in Chile is a major problem. The country’s Gini coefficient value stands at a record 0.5, one of the highest in the world. In 2014, former president Michelle Bachelet introduced a profound tax reform aimed at fighting inequality and providing improved access to education and healthcare. The reforms are expected to generate additional tax revenues equal to three percent of Chile’s GDP. Chile’s capital markets are well developed and open to foreign portfolio investors. Capital markets are structured into three major sectors, with each regulated by a different oversight agency. Pension fund management companies receive the money of workers (or affiliates) and offer these resources to the market, mainly through the purchase of bonds, other debt instruments, equities or alternative instruments. The Superintendency of Pension Funds is the regulatory body that oversees these companies. Banks receive money from depositors, provide the market with capital – mainly through credit or loans – and are regulated by the Superintendency of Banks and Financial Institutions. The securities and insurance market, meanwhile, includes all the institutions that trade public securities. The Financial Market Commission regulates this. In 2010, the Chilean Government enacted Law 20448, also known as MKIII, which introduced several changes to Chilean capital markets. This legal amendment was aimed at encouraging liquidity, financial innovation and integration with international markets, and was part of the continuous modernisation process of the Chilean capital market, which began with MK in 1994. In a recent analysis of 20 emerging markets, Chile was found to have the highest quality rule of law, very low corruption and a superior quality of regulation. Still, it ranked less favourably in terms of shareholder protection, corporate governance and transparency. However, the public’s perception of the strength of shareholder protection is below the OECD average and the country has the most opaque corporate sector of all emerging markets. Although the discrepancy between the general quality of Chile’s institutions and its disappointing levels of corporate governance and transparency certainly stems from more than one cause, the prevalence of conglomerates and highly concentrated ownership levels are possible contributing factors. The Chilean Stock Exchange is the third-largest exchange in Latin America and, as of March 2018, its market capitalisation stands at $217.85bn. The market-capitalisation-to-GDP ratio, which when compared with the historic ratio indicates whether a market is over-or undervalued, stands at 80 percent. In terms of the fixed income market, Chile stands out as the second-largest in Latin America, with a total traded value of $745bn for the year ending December 2017. The financial services industry accounts for five percent of the country’s GDP and is made up of more than 200 local institutional investors, banks, insurance companies, asset managers and pension funds, in addition to 25 brokerage houses. By the end of last year, the local industry of mutual and investment funds reached $78bn in assets under management, accounting for 36 percent of Chilean GDP. Chile is an attractive destination in Latin America for investors who value its open market economy, the richness of its natural resources, its well-developed institutions, its juridical security, its low levels of risk, the high quality of its infrastructure, and its strong rule of law. The government’s positive attitude towards foreign direct investment (FDI) is another advantage, as is the fact that Chile’s legal framework for attracting and protecting FDI is solid. The Foreign Investment Promotion Agency, created in 2015, provides services for FDI in four categories: attraction, pre-investment, landing and aftercare. Very few restrictions exist around FDI. Chile’s conversion and transfer policies are similar to those found in highly developed countries, such as the US: Chile has 41 bilateral investment agreements in force, in addition to 24 other investment agreements, including the investment chapter of its free trade agreement with the US. A US Chile bilateral treaty to avoid double taxation was ratified by Chile and is currently awaiting ratification in the US Senate. The flows of FDI in Chile, which peaked in 2012 at $27bn, have now returned to pre-2012 levels. In 2016, FDI flows reached $11.3bn. According to the United Nations Conference on Trade and Development’s World Investment Report 2017, Chile is the third most attractive country in South America in terms of FDI, after Brazil and Colombia. The country ranks 55th out of 190 countries in the Doing Business 2018 report, issued by the World Bank. Chile’s new president, Sebastian Piñera, has announced his desire to attract financial support, particularly with regard to the mining industry, and to streamline the country’s investment process. Following the presidential election of December 2017, in which Piñera was elected, various sectors have been exhibiting encouraging signs. This should foster more foreign and local investment, which will lead the economy to a rate of growth not seen in recent times. However, it is undeniable that the Chilean economy is embedded within the global context, hence the direction of world growth also impacts the local economy. It is for this reason that the market and its authorities are monitoring commercial tensions between the US, China and Europe very closely. As countries mature, the factors that boost growth in the early stages start to lose their potency, fuelling the search for new sources of productivity and growth. Here, financial markets play a key role in paving the way to becoming a developed country. 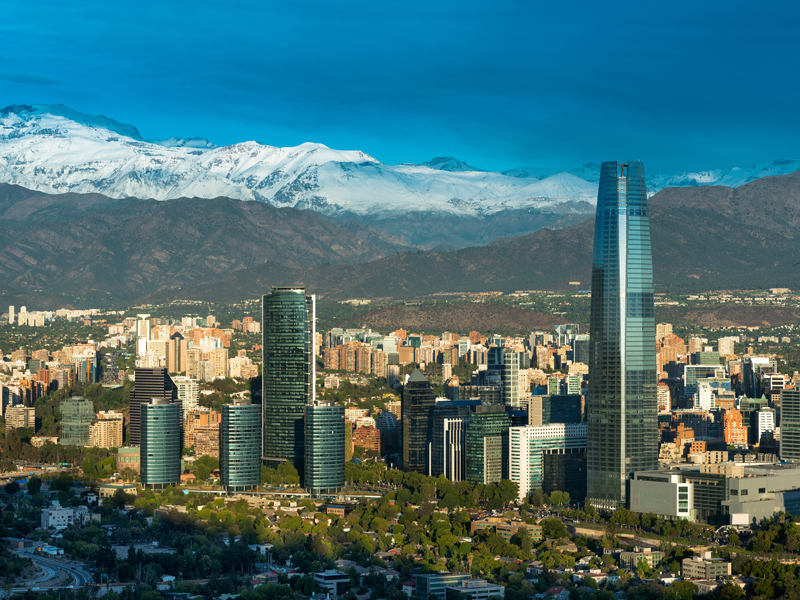 Inversiones Security is a leading player in wealth management, brokerage and asset management, and is intent on playing a key role in Chile’s financial development. As the sixth-largest brokerage company and the fifth-largest asset management company in the local market, we’ve set ourselves the goal of improving the finance industry’s entire value chain from start to finish. Given the highly personalised service we offer to our private banking clients, we have chosen to focus on a number of key strategic areas within the value chain. Customer service and business intelligence are both essential. Our customer service and quality assurance group works in close coordination with our business intelligence group to ensure our clients are fully satisfied and that feedback is collected so performance can be reviewed. By taking operations, IT and compliance into consideration, we also ensure that new software, systems and workflows are implemented in an appropriate manner. Our three investment factories (mutual and investment funds, international asset classes and local direct asset classes) help us to produce suitable products for our clients. Our department of research, meanwhile, provides us with the macroeconomic guidelines that enable us to build a solid and well-diversified asset allocation for both our clients and the rest of the market. In terms of digital transformation, we have worked with innovative local players, while maintaining a global perspective. With our comprehensive understanding of the global and local technological landscape, alongside our emphasis on customer experience, we have initiated a transformation roadmap that allows us to incorporate new technologies in phases. This ensures that our different client segments have access to the digital solutions that are right for them. Regarding wealth management, the decision has been made to incorporate the new functionalities that clients are demanding in the digital age, such as increased transparency, accessibility, mobility and information. At the same time, we aim to enhance the personal relationships and advice that our dedicated bankers can provide. The first stage of this transformation was launched in February with a new, fully responsive website, which has been developed in accordance with the needs of our clients, strict local and global benchmarking, and which provides us with a platform capable of incorporating new technological improvements periodically over time. For 2018, we have a demanding and exciting project portfolio, with an open mind for new incoming developments and client needs.